About the oldest historical features of Brimpton are five Bronze Age Round Barrows which stand near the parish's southern boundary. They are called the 'Borson Barrows' and are referenced as boundary markers in a Saxon Charter of AD 944. A later Iron Age settlement has been identified in the parish and the Romans were there too. The hypocaust, presumably of a villa, was once uncovered, but records of its exact location are confused. It may have been opposite Brimpton House, near the parish church which is said to once have had Roman tiles incorporated into its walls. The Saxon Charter covering Brimpton deals with eight 'hides' of land which King Edmund the Magnificent gave to his thegn, Ordulf. An even earlier owner is supposed to have been one 'Brynni' after whom the place was named, Brimpton being 'Brynni's Town'. However, as 'Bryn' is Welsh for hill and the village stands on a rather prominent hill between the Rivers Kennet and Enborne, it seems likely that this is the real origin of a place-name which has become a Saxo-Celtic hybrid. It probably related to the Iron Age settlement, but the Saxon Charter also hints at a later Celtic survival in the area through the name 'Welshman's Bridge' which was near the present Quaking Bridge. Ecclesiastically, Brimpton originally came under the jurisdiction of the minster church at Thatcham, but by the time of the Domesday Survey (1086), there were two manors in the parish, both with their own church. Brimpton's was on the site of the present building. Shalford's was at Brimpton Manor Farm and is now represented by the 14th century chapel of St. Leonard there (which had become a barn by 1614!). 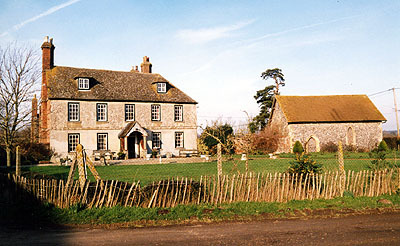 The farmhouse, once called Brimpton Court, is an interesting old building surrounded by the remains of a 13th century moat. It has a priest hole in the Dining Room which was discovered in the 1960s. From the late 1100s, Shalford Manor belonged to the order of warrior monks known as the Knights Hospitallers. It was run by a 'master' - 'Luke the Hospitaller' is mentioned in 1254 - with the help of two or three brethren, but the farm workers were mostly lay servants. The complex had a wooden hall, a mill, a dovecote and its own chapel with a bell and an reverred statue of St. John. Edward I visited the monks in 1302 but, by 1338, the establishment had fallen on hard times and was merged with the a similar one at Greenham. By 1516, the whole place was leased out to tenants. The present house dates form about 1600. The chapel is no more, but two burials were discovered in the area in 1966. Hyde End in the parish may also have had monastic connections. It is thought that there was once a small grange of Hyde Abbey (in Winchester) there. They certainly had rights to extract timber from the adjoining Forest of Pamber. In the early 19th century, Brimpton Common became famous as the scene of a pitched battle during the 'Swing Riots' of 1830. A mob from Aldermaston and Wasing, was marching through West Berkshire protesting about farm workers' redundancies due to the introduction of machinery. They gathered on the Common where the Riot Act was read to them. However, the Constables and Magistrates failed to persuade them to disperse and it was left to the Rev. Cove to faced up to them! © Nash Ford Publishing 2004. All Rights Reserved.